Nose: An incredible array of aromas will entice you with several waves: spices, baked peaches, black pepper, licorice, fig, nutmeg, cloves, honey, violet and marzipan. Palate: A long Grande Champagne finish. A stunning expression of five decades worth of slow maturation and biding one’s time, the Audry Réserve Aristide will encapsulate your senses and take you on an aromatic journey. It has been bottled straight from the Limousin and Tronçais oak barrels in which it has spent 50 years aging, hence its deserved Reserve Cognac status. Audry have outdone themselves with this wonderful ode to the Grande Champagne, whose eaux-de-vie they manage to capture so well in aroma, color and flavor. In the words of Jean Aubry from Montreal: "The most perfect example of an eau-de-vie that reveals itself like Russian nesting dolls. Once you have started you can't stop yourself looking ever further". The Grande Champagne is renowned for producing premium quality Cognacs, with a light and floral quality. The Réserve Aristide Cognac does all of this and more. Thanks to the unique soil composition of chalk and limestone, the soil drains incredibly well and vines remain hydrated. The cru is positioned on the hillside of the Cognac region, making for optimal sunlight exposure and all of the perfect properties of a Premier Cru Cognac. 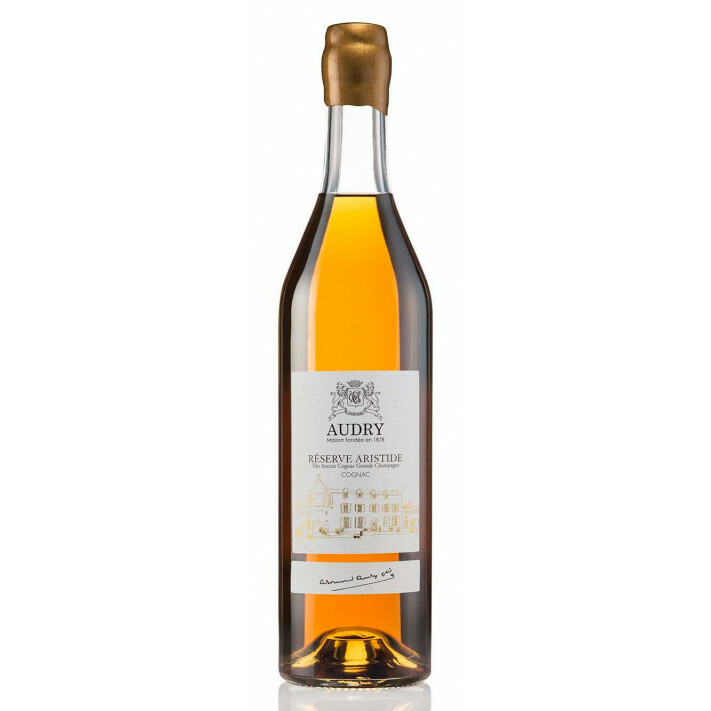 The Cognac house of Audry is all about modesty; having bided their time for decades after halting production in the 1950s, they now release limited numbers of exquisite Fine Champagne Cognacs using the treasures of their Paradis Cellar which started again in 1978. This is how Cognacs such as the Réserve Aristide come into being. Enjoy this Cognac neat to savor its age and quality. Sealed with a gold wax seal, it exudes luxury. The bottle is simply and tall, with a chic labeling denoting the Cognac house and a gold-leaf sketch of the estate. The presentation sleeve is a deep mahogany color. Audry's Artistide has a beautiful colour, but is rather rough on the nose, for an instant sweet in the mouth but at the end rather punchy. It's a masculine cognac, okay, but most important it's an authentic one.